Not so long ago, in a galaxy that's right here actually, there was this Star Wars-themed keyboard from Razer. It boasted not only a number of impressive features for a keyboard, but also a big ol' tie-in to a now-troubled MMO. Want the features without the branding? Razer's got you covered. 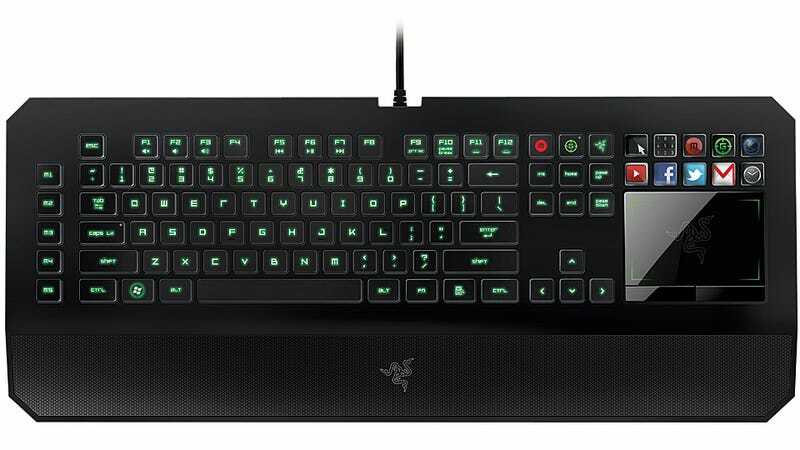 Razer announced the new keyboard, the Deathstalker Ultimate, at Gamescom this week in Germany. The Deathstalker features the same chiclet-style keys as its Star Wars branded sibling, and also the same major gimmick. That is: where a normal keyboard has a number pad, the Deathstalker Ultimate has a touch-responsive LCD panel that can perform a wide array of functions. Including pretending to be a number pad, if that's your thing. While the programmable touchscreen hasn't necessarily added much to the keyboard so far, Razer also announced that the software development kit for SwitchBlade UI—that panel—is now available. The SDK will allow anyone with the requisite skills (C++ and C Sharp programming) to make apps that will run on the keyboard, and perhaps make its LCD panel more broadly useful. That's right: here in 2012, even your keyboard needs to be constantly running apps. The good news is, the touch, feel, and responsiveness of the Star Wars version were great, and the non-Star Warsy edition will be available for purchase next month. The bad news is, it'll cost you $250. Alas.